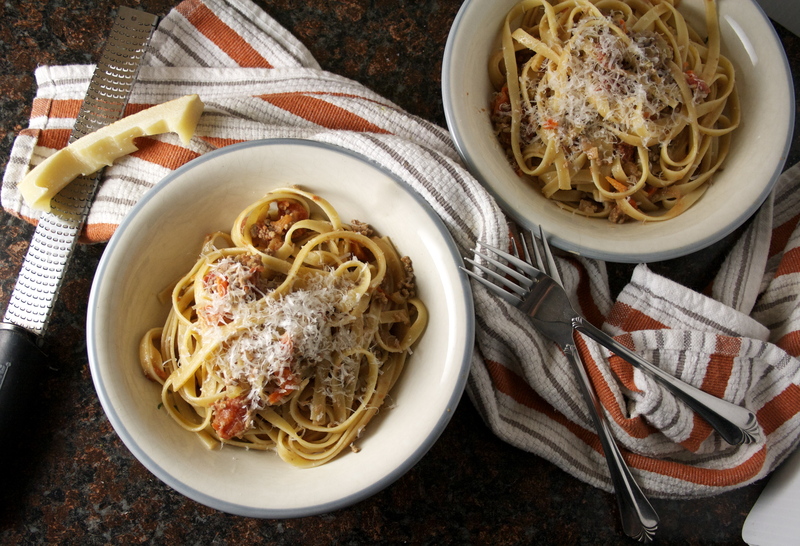 But possibly the best part (which raises the “fat” question) is the carbo-load — a necessity to shore up the body’s glycogen stores to fuel the 26.2-mile haul. Granted (and I think I’ve said this before), I generally don’t need to do anything too out of the ordinary to make this happen. I’m a pasta fool. But after my longest, hardest effort two weeks ago, in the form of a 22-mile run up to the Little Red Lighthouse and back, I decided to shake it up a bit and go beyond my usual penne alla vodka, or spaghetti aglio e olio, or simple tomato and basil, and put in a bit of effort. 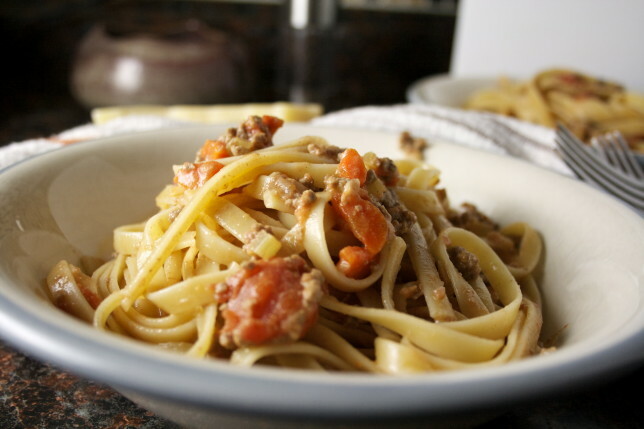 I decided to make a true bolognese. This is truly a labor of love. Thankfully I chose to do this the day after my run, when I was okay with the possibility that I’d have to be on my feet more than just the 20 seconds it takes to walk into my kitchen and pour a bowl of cereal. The steps are simple, but they take time. But oh, are they worth it. Onions, carrots, and celery are sauteed. 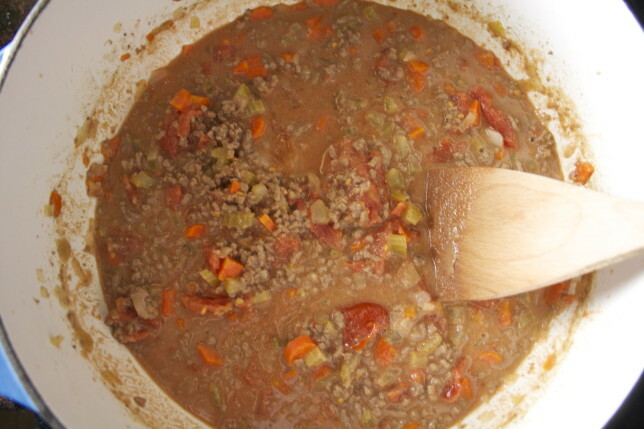 After the meat is browned, it grows heavy after being simmered in milk. Then in wine. Then finally, it’s left to gently and slowly putter away with some tomatoes for a good three hours — enough time to watch your favorite Sunday afternoon PBS cooking shows. It’s rich, for sure, made beautiful and complex with tender loving care and simple ingredients, including a grating of nutmeg. 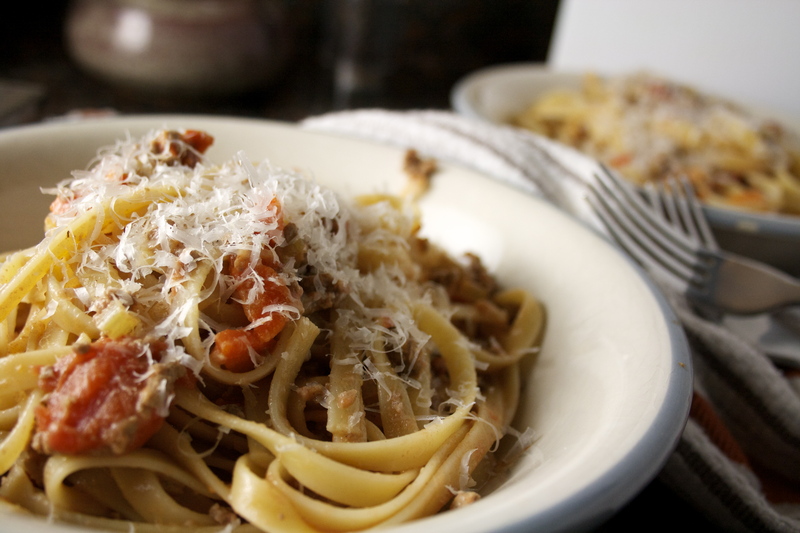 This bolognese nothing short of a treat that will, if you’re a family of two, last for at least three nights. The fella says it’s restaurant quality. Good, because in this restaurant, eating in your pajamas, with your feet tucked under you on a couch, is not only allowed, it’s welcomed. I must admit that I prefer this a little more tomato-y than Marcella’s recipe indicates. I probably used closer to 2 cups of tomatoes, and might consider using more when I make it again. Chalk that up to the fact that “meat sauce” in my family has basically meant tomato sauce…with meat. This is decidedly more complex, and truly, with an extra grind of black pepper at the table, there’s probably no need for more flavor than it already has. Place the oil, butter and chopped onion in pot or dutch oven and turn the heat to medium. 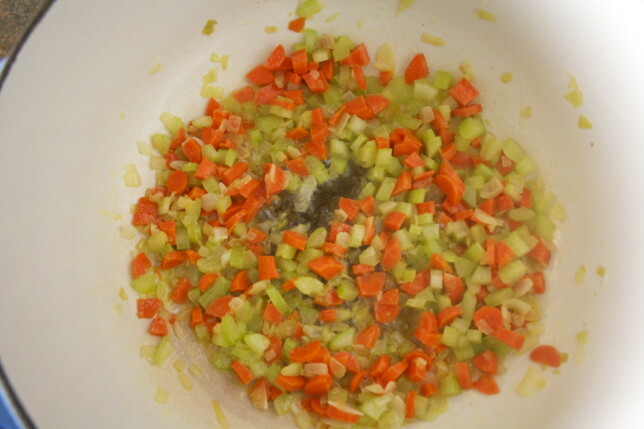 Cook and stir the onion until it has become translucent, then add the chopped celery and carrot. Cook for about 2 minutes, stirring vegetables to coat them well. 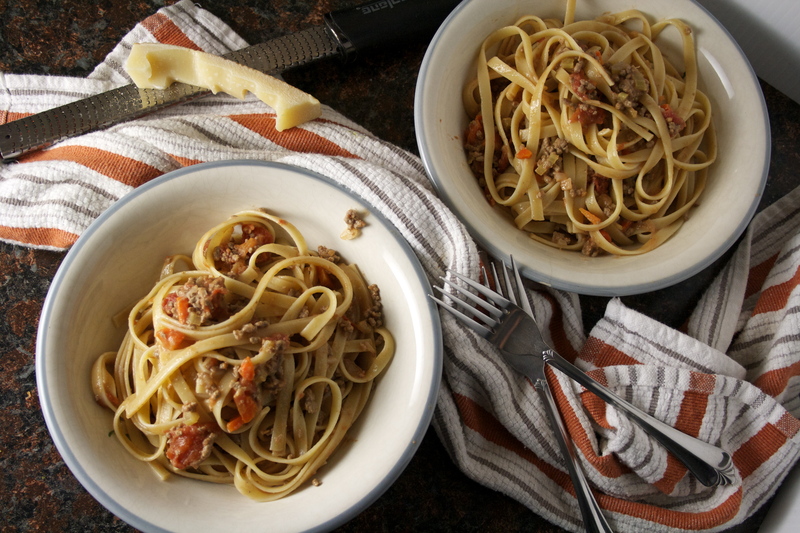 Toss with cooked drained pasta, adding the tablespoon of butter, and serve with freshly grated parmigiano-reggiano and freshly ground black pepper. Looks delish! Can’t wait to have my kitchen completed to try all your recipes. You are so sweet, Suzanne! Can’t wait to see photos of the new kitchen when it’s done!